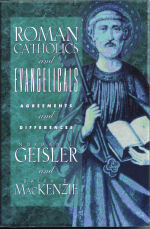 Books | Roman Catholics and Evangelicals: Agreements and Differences | Watchman Fellowship, Inc.
What do Roman Catholics and evangelicals have in common? More than you think! In this comparative study of history and current theologies, Geisler and MacKenzie reveal their common ground in areas such as justification by faith, doctrines of revelation, theology, ethics, and many others. You'll also learn why both faiths remain apart regarding sacramentalism, Mariology, and more. A final section details a program of cooperation in key areas such as evangelism, morality, and education.